Craigroyston manager Grant Carnie has hailed the application and work rate of his new club as they aim for a place in the semi-finals of the King Cup. Carnie’s side host First Division Heriot-Watt University in tomorrow’s third-round clash at St Mark’s Park (2.30pm) after Wednesday’s 4-2 second-round win over Stirling University at Gannochy Complex. Craig Dickson, Chris Inglis, Craig Anderson and Chris Eadie were all on target for the Warriston outfit midweek, and Carnie believes strengthening in the forward areas since his arrival last month has been key to a side that has managed just 26 Premier League goals this season. “We brought in Chris Eadie fron Glentanar and Chris Rooney from Selkirk to help add a bit more firepower up front and it’s paid off for us,” said Carnie. Heriot-Watt, meanwhile, will be looking to claim a second Premier League scalp in the King Cup after dispatching Easthouses Lily in round two. 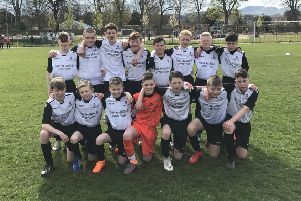 Chris Smith’s students were also in midweek action, against Duns in the First Division and had to come from behind twice to secure a 2-2 draw at Riccarton, with Sean Muhsin and Elliot Sutherland on target. In tomorrow’s other fixtures, Leith Athletic travel to Coldstream for the second time in a cup competition this season, having lost 2-1 in the South Challenge Cup back in November. Derek Riddel’s side have already netted 12 goals against Coldstream in three league encounters this season and will be looking to add to that tally. The winner of that tie will face the winners of the match at Ainslie Park where Spartans EOS host Tynecastle. Keith Boyes is the only absentee for Spartans EOS, while Tynecastle will be hoping for Chris Milligan and Tony Muir to continue their recent goalscoring form. Lothian Thistle Hutchison Vale face First Division unbeaten league leaders Peebles Rovers at Saughton Complex.